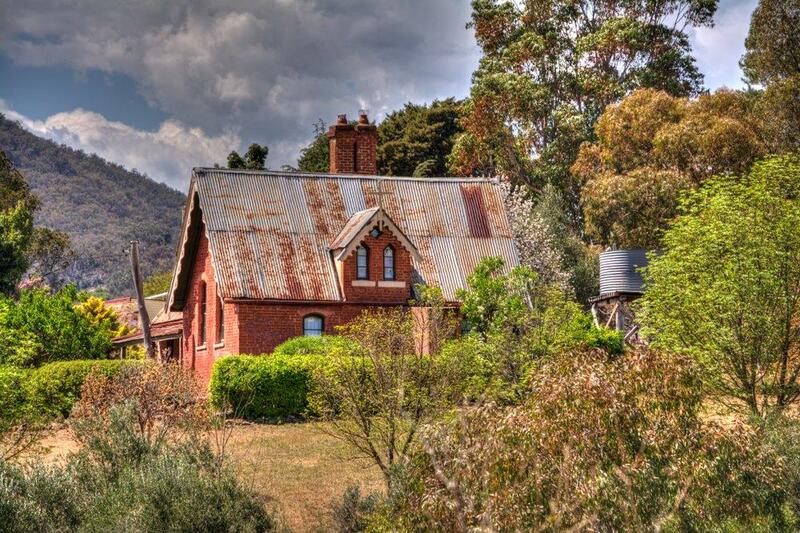 Sofala is Australia's oldest surviving gold-rush town, just 49 km from Bathurst in New South Wales. The village has only two streets, with most of the buildings in original condition. Edward Hargraves discovered gold nearby in early 1851 and by the end of the year the settlement of Sofala had a population of 10,000 people. The Royal Hotel and General Store where built in that year, although most of the population lived in tents, slab or bark huts, even "gunyahs" made from the boughs of trees. Many stores were built that stocked fine millenary and imported shoes and there were an estimated 500 sly "grog" shops. Typical of the boom and bust of gold rush towns the population had dropped to 5000 by the end of 1852. Mining continued in Sofala until the 1930s. This article appeared in the Sydney Morning Herald in 1935. "Though the gold has gone, Sofala is by no means defunct. There are rich grazing lands to support the township, and the district is famous for its splendid production of honey, an industry that is rapidly increasing in value to the community. lt is confidently estimated that £30,000 worth of honey will be sent away to Sydney and other markets this year. The rabbit and fox skin trade has attracted large numbers of trappers for years past. The upper Turon River is said to team with fine trout, and attracts many enthusiastic anglers." 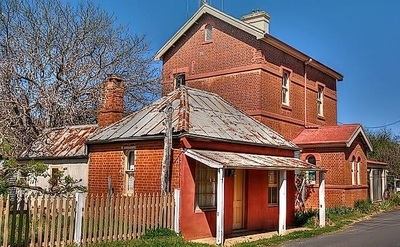 The former Sofala Post Office (right) was designed by Colonial Architect James Barnet and built in 1879. 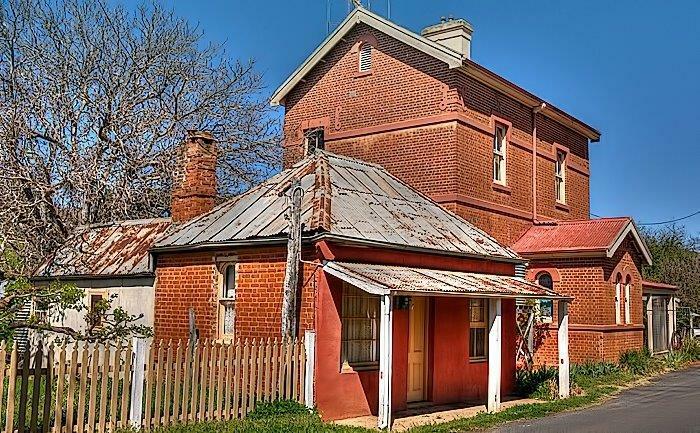 It remained a Post Office until 1989, when it was converted into a private residence. autrThe Sofala Convent opened in 1872 and remained in service until 1909. The church it housed closed in 1970. The building is now a private residence. The original church on the site, was built in 1851 by the first Church of England Bishop in Australia, Right Reverend William Grant Broughton. He was born in Westminster and educated at The King's School, Canterbury where he was a King's scholar. The church he built was made of white canvas. Hill End is 35 kilometres from Sofala and was a much more significant gold rush town. At its peak in the early 1870s it had a population of 8,000 served by two newspapers, five banks, eight churches, and twenty-eight pubs. As the gold ran out the decline of the town was dramatic: by 1945 the population was 700. At the 2006 census, Hill End had a population of 166 people. 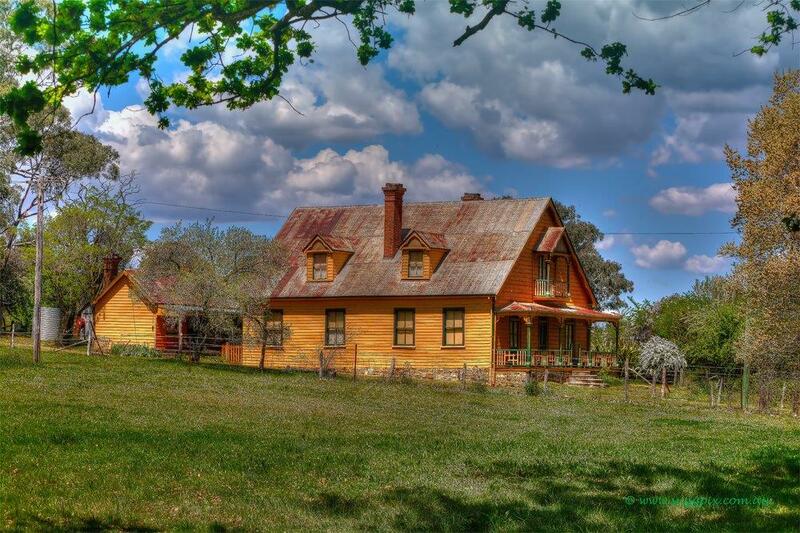 Many fortunes were made, this impressive double story A frame style house was built in 1878 by James Marshall. He wanted a reminder of his homeland and it was meant to represent a Scottish Hunting Lodge (Craigmoor). It was large enough for the separate kitchen to double as the servant’s quarters. Gold digging was good to James who arrived in Australia as a farm worker. The house has been preserved in its original condition and tours are available. The National Parks and Wildlife Service have classified the town as an historical site. The remaining residents are artists or operators of the only remaining Pub, Store and Bakery. While many buildings remain, plaques have been installed on vacant sites in the town with a picture of the original building and details of its occupiers. 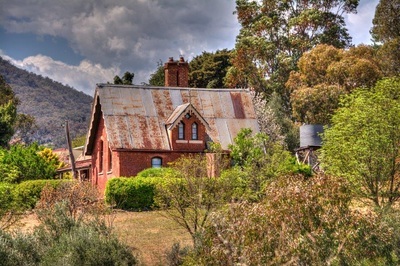 Hill End is a popular tourist destination, a walking track in the town leads to mines and other ruins. The most popular tourist activity in Hill End is gold panning, with some of the older members of the community running gold panning tours in the very same fossicking areas that yielded the gold which brought on the gold rush. Metal detectors or gold panning are not allowed within the historic site, however there is a fossicking area just past the cemetery. Fossicking equipment can be hired in the Hill End settlement. The Royal Hotel and the local Bed and Breakfasts offer accommodation, and there is a range of camping options within the town limits. Communications in Hill End are limited to the local payphone and some mobile phone carriers. Visiting the town and walking the now vacant streets is a haunting experience, the impressive churches and public buildings that remain are testament to the wealth of the area and its inhabitants over 100 years ago. The best way to visit both towns is by car either from Bathurst or Sydney. Don’t forget to bring a good camera.